Remember when the Wild was cruising atop the Western Conference with a comfortable lead in the race for the top seed? Exactly one month ago, for instance, the Wild had 84 points and led both division rival Chicago and Pacific Division-leading San Jose by seven, with at least one game in hand on each. At the rate Minnesota was going, the team was going to be hard to catch. There had been no real swoons. Every time the Wild lost in regulation, it found a way to win the next time out. And then, well, March happened. Some defensive cracks that had already become evident even as the Wild won in January and February turned into larger voids when the team stopped scoring as much. As a result, Minnesota has lost eight of 10 games this month. That seven-point lead over Chicago? It’s now a seven-point deficit to the Blackhawks, with precious few games remaining (10 for Chicago, 11 for Minnesota). The Wild has lost three consecutive games to the Blackhawks, all since Feb. 8. As Minnesota has swooned, Chicago has soared, going 17-3 since the start of February. The Wild will still make the playoffs and is still among the top teams in the West, but the season is suddenly more vulnerable. So the question becomes: how concerned should we be about the Wild? 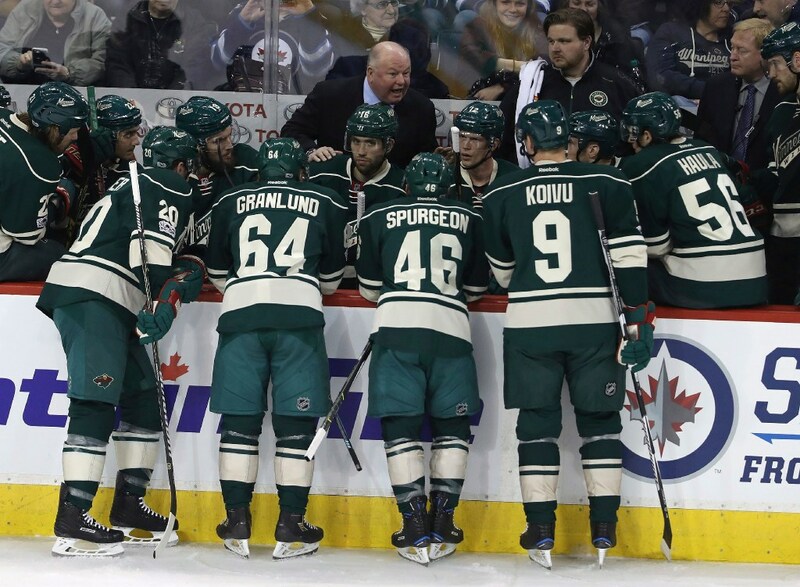 Is this cold spell foreshadowing a quick playoff exit, putting a major damper on a breakthrough season under first-year coach Bruce Boudreau? Or is this merely an uncomfortable but short-term slump, better experienced in March than in April or May during the playoffs? Let’s try to sort things out. *During this 2-8 stretch over the last 10 games, the Wild has been held to two goals or fewer seven times. That’s not good, of course, but it stands in stark contrast to the rest of the season. Minnesota still leads the West in goals scored (232), so the body of work suggests this is more of an offensive slump caused by a combination of illness and maybe some tired legs slogging through a brutal closing schedule. *Along those same lines, slumps are natural — even for good teams. Last year’s Stanley Cup champions, the Penguins, went through a 2-9 stretch early in the season before rebounding. Two years ago, the Blackhawks lost their final four regular-season games before going on a playoff run and winning the Cup. The Wild’s body of work over the first two-thirds of the season suggests this recent poor stretch is not a trend. This isn’t the hot-and-cold Wild of past years. This is the first sustained stretch of losing all season. *While goalie Devan Dubnyk’s overall numbers this season are still very good — 36 wins, .927 save percentage, 2.18 goals against average — he’s certainly been more human than he was during a torrid start to the season. In his first 27 games this season, Dubnyk had a .947 save percentage. That wasn’t going to be sustainable, and here is the result: in his last 31 games, that percentage is just .908 — not terrible, but a notable drop-off. The Wild continued to win until this month even after Dubnyk cooled off thanks to a terrific offense. This month during the Wild’s swoon, his save percentage is .899. Even the best teams often need their goalie to steal a game during the playoffs. Neither Dubnyk nor the Wild’s defense gives you confidence in that happening right now. *For as good as the Wild was for the first two-thirds of this season, much of the good work was done largely with a roster that was quite similar to those of years past — when the Wild was a playoff team but not among the league’s best. If we take the long view of the past four or five seasons, it is possible that the Wild team we saw for much of this season was an overachieving outlier. When a team that had been rolling along suddenly loses eight of 10 games — complete with players-only meetings and terse post-game press conferences from the head coach — some level of concern is warranted. That said, a bunch of these recent losses have been on the road and were out of character in relation to the bulk of the season. The Wild should get the benefit of the doubt that it can find its game over the rest of the regular season — and having seven of 11 at Xcel Energy Center should help. In the end, losing the division race to Chicago — likely at this point — isn’t as important as how the team is playing once the playoffs start. Either way, this season was likely going to be defined by a potential second-round matchup against the Blackhawks. If Minnesota can get to that point and get over that hurdle, this regular-season dip will be forgotten. But if the season ends there — or sooner — we will certainly look back on March as the time when things started to come apart. Poll: How concerned are you about the Wild's recent play?